Costa Blanca, the coast of the Spanish Alicante province is for many travellers to southern Spain a synonym of lively resorts, white sandy beaches and animated nightlife. Major holiday resorts of Costa Blanca are located in Benidorm, Torrevieja and, naturally, around the area’s major city, Alicante. 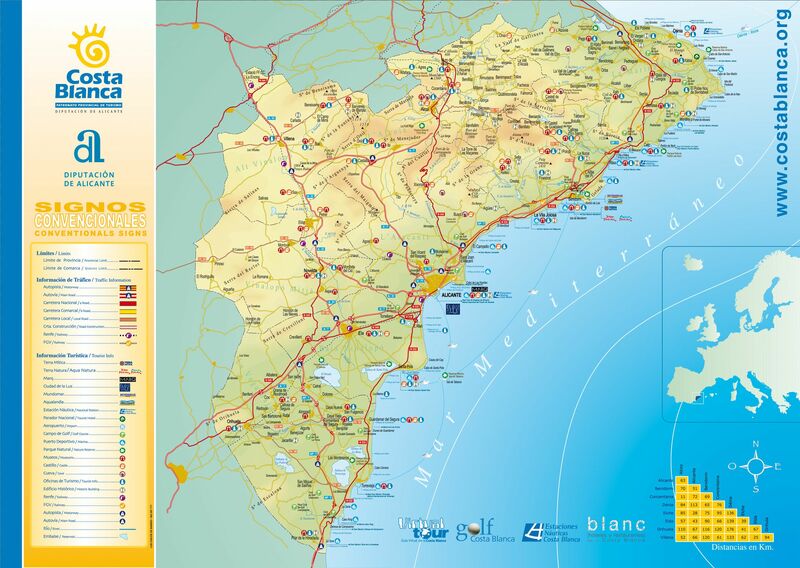 See map of Costa Blanca (click to enlarge). Costa Blanca’s tourist offer goes beyond the beach and relaxation in the sun. Find below a few suggestions on what to see in Alicante. The most characteristic element of Alicante skyline is the imposing Santa Barbara Castle rising on the top of Mount Benacantil. This medieval fortress was built by the Muslims in the ninth century, having had several elements added later, along the centuries. A wonderful panorama of Alicante coast is available from the Santa Barbara Castle where the Museum of the City of Alicante (MUSA) is also located. The entrance to the castle is free, you will however be charged €2.70 (price for mid-2015) to use an elevator which connects the castle to the ground level (stop near the main avenue Juan Bautista Lafora, in Alicante city centre). The alternative, a walk from the city up to the castle, is recommended only for the fit tourists. A relatively ‘modern’ counterpart of Santa Barbara Castle, the San Fernando Castle raises on the Tossal hill, slightly further away from the historical centre of Alicante. The castle was built in early 19th century, during the Spanish Independence War and today the monument of the heroes of the Spanish Independence is one of the castle’s attractions. A number of recreational activities are available in the parks surrounding the castle. The oldest active church in Alicante, Basilica de Santa Maria, was raised between the 14th and the 16th century on the ruins of a mosque. The Basilica is an interesting mix of architectural styles, from the baroque, elaborate portal, through the rococo altar, to gothic elements of the church’s main structure. Locally referred to as ‘Ayuntamiento’, the city’s town hall occupies an 18th century baroque palace, often visited by the tourist. The most interesting features of the Alicante Town Hall are the characteristic two towers and their ornamental elements. Several rooms inside the palace are open for visitors. To a great surprise of many holidaymakers, who expect mostly beach and relaxation in the sun in Alicante, the city has quite an interesting offer of museums. Museo Arqueológico Provincial de Alicante, shortly referred to as MARQ, is by far the most visited. Chronologically arranged expositions of Alicante archaeological museum take visitors on a journey through the fascinating history of the region, from prehistoric to present times. Apart from the artefacts, the museum offers audio-visual presentation and inter-active exhibitions to enrich the visitor’s experience. Find more information on MARQ official website. The most popular ‘hang-out’ place for Alicante’s inhabitants and a must for the tourists is the city’s main promenade, known as Explanada de España, or Passeo de La Explanada. It is said that six million of red, white and blue tiles were used to create the characteristic wavy pattern of the pedestrian walkway, lined with palm trees and stalls where the local craftsmen sell their products. Some of the city’s most remarkable buildings are located along the promenade, where there are also plentiful open air restaurants, cafés and ice cream stops. At the peak of the tourist season the promenade is busy during day and night with different sorts of street artists putting on a show for tourists. Explanada de Espana runs along Alicante’s yacht harbour. The city of Alicante is blessed with a great coastline; several great beaches are locates within a manageable distance from the city centre. In the very heart of the city, the over 900 meters long soft sand Postiguet Beach attract tourists with its splendid location, just a few steps away from the historic centre and with a splendid view to both the Mediterranean Sea and the Santa Barbara castle. A well-developed infrastructures, with plenty of parking spaces, designated areas for sports and a wide choice of eateries and cafés. Postiguet Beach is frequently awarded the Blue Flag distinction for safety and cleanliness. On the eastern extreme of the Postiguet Beach, there is a small Playa del Coco, which, in the past was used as a fishermen harbour. To the northeast of the city centre, Playa de la Albufereta is a small but pleasant soft sand beach, popular with the locals and less frequented by the tourists. In the same direction, approx. 4.5 miles from Alicante city centre, stretches a superb San Juan Beach, considered to be one of the best beach locations in the continental Spain. Near the beach there is the 18-hole Alicante Golf course. Playa de San Juan can be accessed from Alicante by tram; take the tram to El Campanello stop - the trip takes approx. 25 minutes. Optionally, Alicante car rental is a convenient way of exploring Costa Blanca, where the beaches usually offer good parking facilities, unlike the busy city centres. Related article: Alicante Airport car hire - Spain car rental with Cartrawler. On the way from Alicante to San Juan beach, a small Playa de la Almadraba attracts tourist who prefer more discreet location, away from the tourist crowds. Almadraba beach, despite its fairly small size offers parking, umbrellas and sunbeds rental and access for disabled. Playground is available for children. Approx. 11 nautical miles offshore from Alicante, near the Santa Pola, the Tabarca island is a popular destination for day trips in Costa Blanca. A refuge for pirates in the past, in the 18th century, the island gained, by the order of king Carlos III, a fortified town, being today considered a site of cultural interest in Spain. In 1986, the crystal-clear waters surrounding Tabarca were declared (as the first in Spain) a maritime reserve due to the diversity of its maritime fauna and flora. Snorkelling and scuba-diving are amongst the major attractions of Tabarca. The island can be reaches by ferry from Alicante, Santa Pola and Benidorm ports (after an approx. 1 hour trip). Alicante Port in the very heart of the city, apart from its original function, has developed in the recent years into a leisure centre. The modern El Puerto complex is one of the most sophisticated locations of Alicante: the upmarket restaurants and clubs, as well as chick boutiques of the Panoramis shopping centre attract rich and the famous. At night El Puerto, with its many bars, discoes and the casino (Casino Mediterráneo) becomes Alicante’s party hotspot. Spain is known for many colourful and joyous popular festivities (fiestas) held locally in different parts of the country. In Alicante, the most famous local celebrations are the bonfires of Saint John (Hogueras de San Juan, in Spanish). Linked to the summer solstice, the bonfires are held in June and preceded by many months of preparations. The week-long feast includes firework displays, medieval market, parades in historical costumes and setting on fire large satirical figures made of paper mache. The key to Alicante’s success as a tourist destination is its work climate with mild winter, hot summers and an average annual temperature of 18 degrees Celsius. In the coldest month of the year, in January, Alicante registers average temperatures of around 12 degrees. Between April and late November temperatures above 20 degrees Celsius can be expected in Alicante, with the peak in July and August when the mean daytime temperature reaches 30 degrees. See detailed Alicante climate chart (showing average temperatures, sunlight hours, precipitation and humidity). Sea temperature in Alicante area exceeds 20 degrees between June and October. What to see in Alicante? Best beaches of Alicante: Postiguet, Playa de San Juan, Playa del Coco. Alicante nightlife El Puerto, casino. Santa Barbara Castle. Alicante museums. Weather Alicante. Passeo de Explanada.